Home / News & Media / News / Where is Thai Democracy heading after the Elections? 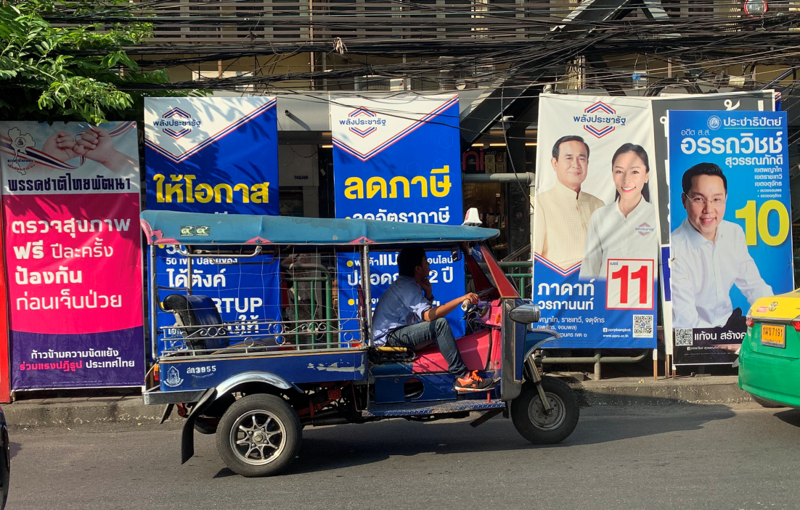 The much-anticipated General Elections in Thailand are finally about to take place on Sunday, 24 March 2019. It will be the first under the 2017 Constitution. Commentators have said that this Constitution, along with the new electoral framework promulgated under it, will prevent the return of former Prime Minister Thaksin Shinawatra’s cronies to power and will consolidate the military’s power within a democratic state architecture. Pro-Thaksin parties have been winning every election since 2001. The Elections would be the ultimate test to this. As reported by the BBC, commentators are predicting that the multiple parties supporting Thaksin will gain the most seats albeit short of a majority—perhaps thanks to the newly adopted multi-member proportional (MMP) electoral system that limits the number of seats gained to roughly the proportion of votes they received. This is different to electoral systems of the past where bigger parties are able to gain a disproportionate amount of seats to the majority/plurality seats. We shall see. As consequence to not having a majority in the lower house, exacerbated by the fully-appointed senate that will also take part in the election of the Prime Minister, the pro-Thaksin parties will face a steep hill to climb in order to get one of their Prime Ministerial candidates elected. Constitutional experts’ views as featured in International IDEA’s article on the then draft constitution, the current electoral framework is aimed to “tame” pro-Thaksin parties and not to “eliminate” them. Indeed, an electoral system from the proportional representation family, like the MMP that Thailand newly adopted, would likely create a parliament where no party has absolute majority of seats. Look at Indonesia, look at Finland, and look at Timor Leste. In those countries, parties are encouraged to form alliances and coalitions as explained in International IDEA’s handbook on electoral system design. However, as global experiences show, if strong parties are contesting under MMP like in Germany and New Zealand, those parties are still able to achieve majority. Another interesting phenomenon to watch is the ability of Thai voters to cast a “NOTA” (none of the above) vote. As explained in a 2014 web article entitled “Testing Thai Democracy”, there is a box on the ballot that voters mark if they do not like any of the parties/candidates found on the ballot. As the Bangkok Post reported, a former member of the recently dissolved Thai Raksa Chart Party is calling voters to vote “no” in the province of Phrae so that it surpasses votes for any candidates, thus forcing the Election Commission to organize reruns. According to the article, these reruns will enable Pheu Thai Party (one of the main pro-Thaksin party) to field more candidates giving them a chance of winning seats there. This does not seem to have a country-wide effect, though, as there are only two seats in Phrae, but the power of NOTA may not be underestimated in the future if the Phrae experiment works. So, where will all these lead to after the elections? Again, according to those constitutional experts featured in the political commentary on the Thai Constitution article, the current constitution is designed to produce political stability after the tumultuous period since Thaksin Shinawatra came to power in 2001. “Giving people a voice in political institutions should channel conflict into the parliament and away from the streets”, the experts contended. Indeed, no matter what the outcome of the elections is, Thailand will once again have a democratically elected House of Representatives. Even though the National Council for Peace and Order (NCPO) will remain, legitimate debates in parliament within a multiparty democracy will be back. Adhy Aman is a Senior Programme Manager of International IDEA’s Asia and the Pacific Regional Programme and Country Programme Manager for Fiji and Mongolia. A screenshot from the viral video showing: 1. a person taking a ballot out of an envelope, 2. a stack of ballots sitting on the person’s lap ready to be “dealt with”, 3. the person, using a wooden pick similar-looking to those officially produced, punched the ballot at a particular location, and 4. the person would then put the punched ballot back to the envelope and seals it. Source: viral video on social media made by an unknown person. For Thai voters, coming out to vote on 24 March 2019 was one thing; making sure their votes are valid was another. The green poster shows valid marks, while the pink poster shows invalid ones. Image credit: International IDEA. High-level government delegation from Nepal led by Joint Secretary Suresh Adhikari Ministry of Federal Affairs and General Administration, with the International IDEA Secretary-General Yves Leterme and staff. Image credit: International IDEA.